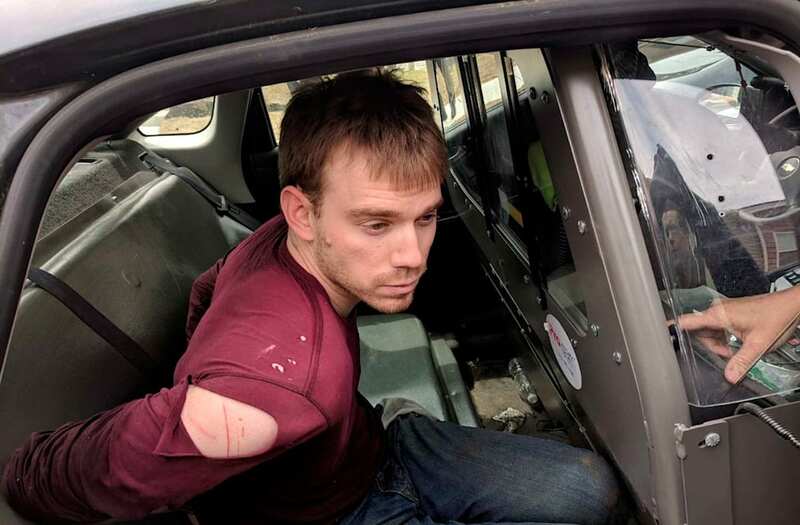 Travis Jeffrey Reinking, who was wearing just a green jacket when he is accused of killing four people at a Waffle House in Nashville, got a new outfit Tuesday from his jailers — and it's also green. It's called a suicide smock — a padded gown made from heavy-duty polyester that is held together with Velcro strips — and the 29-year-old suspect is likely to be wearing it when he makes his first court appearance on Wednesday, Davidson County Sheriff Daron Hall said Tuesday at a news conference. "We've had zero problems with him," Hall said when asked whether deputies had had any trouble with him. "He is alert and he is compliant." Reinking, who lives in Nashville, was arrested Monday less than a mile from the restaurant after a 34-hour manhunt. He was charged with four counts of homicide and then transported to the Maximum Correctional Center in South Nashville, where he was placed in what Hall called "72-hour medical observation." "We have to protect him from other inmates, and that's not easy," Hall said. "We have to protect him from himself." So Reinking is being housed alone in a special cell where he gets checked on every 15 minutes and where he's not allowed anything that could be used as a weapon to hurt himself or others. That includes cutlery. "You're basically eating your food out of a bag" with your hands, Hall said. Once Reinking gets done with his medical and mental evaluations, he'll be moved to another solitary cell, where he'll be confined for 22 hours a day — for his own protection. "He will have two hours a day outside," Hall said. "We do not shock-release them into the general population," Hall said. Meanwhile, investigators are still trying to come up with a motive for Sunday's massacre, which also left four people wounded. In a report obtained by the AP, a former co-worker told Detective Sgt. Rob Martellaro of the police department in Salida, Colorado, that Reinking was paranoid and delusional at times, that he was infatuated with pop singer Taylor Swift, and that he identified himself as "sovereign citizen," people who believe that they don't have to answer to any government authority. At the time, Reinking was living in Morton, Illinois. And although he was not armed, the FBI requested that the Illinois State Police revoke his firearm owner's identification card. He did so, officials said, and transferred his four weapons to his father, Jeffrey Reinking. But Reinking's father gave the weapons back to his son, who allegedly used one of them — an AR-15 semiautomatic rifle — to open fire at the Waffle House, killing four and wounding four before 29-year-old James Shaw Jr. wrestled the rifle out of his hands, police said.